USA Basketball Chairman Jerry Colangelo explains the part analytics could play in selecting the roster for the upcoming 2016 Rio Olympics. LOS ANGELES — USA Basketball plans to crunch the numbers before finalizing its roster for the 2016 Rio Olympics. USAB Chairman Jerry Colangelo said Wednesday that the two-time defending Olympic gold medalists are turning to analytics to help cut a 31-man player pool down to a final 12-man roster. Speaking at the USOC’s Media Summit at the Beverly Hilton, the longtime executive said that USAB has constructed a “model” to help its player analysis process. ​Colangelo, who was recently named chairman of the Sixers, whose front office also includes the analytically-inclined Sam Hinkie, said that USAB is looking at shot charts, end-of-game situations and lineup analysis in weighing its decisions. In recent years, Colangelo and coach Mike Krzyzewski have heavily weighed a player’s “equity” when it came time to make roster selections: Generally speaking, the more experience the player had representing USAB, the better his odds at making the team. While the incorporation of analytics into the process doesn’t represent a departure from the previous approach, it should give hope to analytical darlings without any previous USAB experience. Colangelo only mentioned two USAB players by name during his press conference: LeBron James and Carmelo Anthony, two National Team veterans who would be chasing their third gold medals in Rio. From there, past Olympians like Chris Paul, Kevin Durant, Russell Westbrook and Anthony Davis and 2014 FIBA World Cup standouts like Stephen Curry and James Harden would seemingly have the inside track on selection in 2016. That doesn’t leave much wiggle room. Two players whose ears should have perked up when they heard Colangelo mention analytics and lineup data: Spurs forward Kawhi Leonard and Warriors forward Draymond Green. Entering Wednesday’s action, Leonard ranks No. 2 in the NBA in Real Plus Minus (+9.6) and he boasts an excellent +15.7 net rating for the 54–10 Spurs. Green, meanwhile, ranks No. 4 in Real Plus Minus (+8.9) and has a +19.5 net rating for the league-leading 56–6 Warriors. 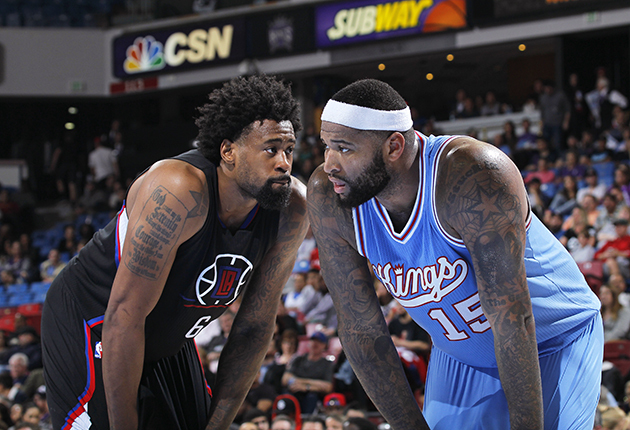 Here’s another dark horse to consider: Clippers center DeAndre Jordan. The punishing lob-finisher ranks No. 9 in Real Plus Minus (+5.9), and L.A. enjoys a +11.2 net rating when he shares the court with Paul. Is that enough to help Jordan, who has no previous USAB experience, stand out from a big man pack that includes Davis, DeMarcus Cousins, Andre Drummond and Dwight Howard, all of whom are past participants? Colangelo’s mention of lineup data is particularly interesting given how many sets of teammates exist in USAB’s pool. Here’s the rundown. Wouldn’t it be at least slightly tempting to include four Warriors—Curry, Green, Thompson and 2012 Olympian Iguodala—in hopes of replicating their insane +33.2 net rating in 490 minutes this season? If Golden State’s core four is that dominant against NBA competition and with a deep three-point line, what happens when the Splash Brothers get to scoot in and they’re bombing away against weaker international competition? This year’s lineup data does reinforce, as Colangelo suggested it might, much of the conventional wisdom around these players. The Durant/Westbrook combination is a winner. The Harden/Howard pairing hasn’t panned out. Wall and Beal belong further down the pecking order. The “Big 3s” in Cleveland and L.A. are still getting it done. Make no mistake, USAB is the prohibitive favorite to defend its gold medals at the 2008 Beijing Olympics and the 2012 London Olympics. Honestly, Colangelo has an embarrassment of riches from which to select, regardless of which metrics he chooses to utilize. The USAB pool includes 18 2016 All-Stars, 12 2015 All-NBA selections, the top eight Player Efficiency Rating performers, 13 of the top 15 Real Plus Minus performers, and eight of the top nine Win Shares performers. A blindfolded person could randomly throw darts at the list of USAB finalists and construct a roster that would enter Rio with gold medal expectations. As it stands, the USAB pool remains in excellent shape health-wise: Beal (leg), Jimmy Butler (knee), Griffin (leg, hand), Howard (knees), and Irving (knee) have dealt with health concerns this year, but none are expected to be sidelined heading into the off-season. The USAB pool includes a number of potential free agents: Durant, Howard, Mike Conley, Drummond, DeMar DeRozan and Barnes. Griffin’s situation is unique, as his latest injury to his hand came about when he punched a Clippers employee during an off-court incident. Colangelo dismissed the idea that Griffin’s conduct, which led to a four-game suspension that he’s yet to serve, will weigh into USAB’s decision-making process. Colangelo added that USAB assistant coach Monty Williams is being given time to decide whether or not he will take part in the Rio Olympics following the recent death of his wife, Ingrid.